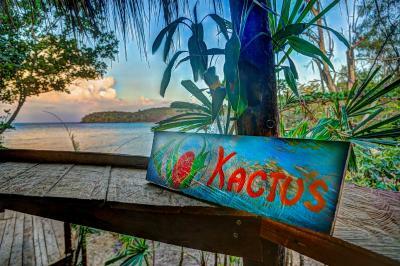 Lock in a great price for Kactus – rated 8.9 by recent guests! Great beach onsite. The staff was really nice and accommodating. The staff was super friendly and tried to help us in anything. My and my friend are vegan so they helped us find food that’s suits us (everyday there are 2 options from the chef’s choice. I loved the food at Katus. Excellent daily menus. Food ranges from $3-8 which isn't bad for the quality. The bungalows were also beautiful with a sea front view. Bathrooms were divine. Food, food and more food. Could have stayed here for weeks if it wasn’t for the lack of space. Best food I’ve had in my entire travel. Cleanest and most amazing beach I’ve seen on my travels. Well build bungalows at a nice stretch of beach. The bungalows are kept clean (cleaned every second day). 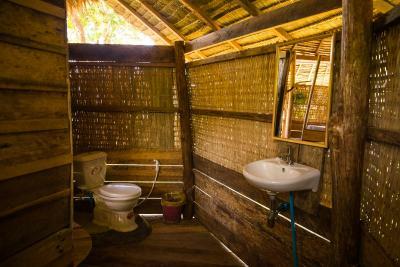 Our bungalow offered a bathroom, which was well equipped (hot water is not available). The fact that the bungalows are open makes for a nice atmosphere. While we were there, there were not many insects during the night either (however, our bungalow's pillars, on which it was standing, got eaten up by termites or the likes, which will probably become a safety issue at some point). The staff are all very helpful and friendly. Restaurant and bar with beautiful deck overlooking the bay. 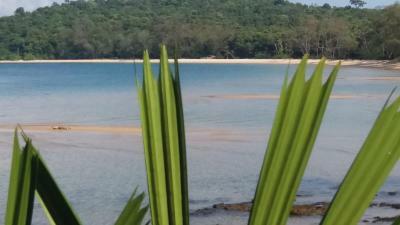 The bay is a good place to swim and there are possibilities for snorkeling by the rocks on the side of the bay. We also used some of their rental equipment like surf boards. The beach is narrow, but very clean. This place is heaven. The people working there. The setting. The food. The beach. The vibes. Breakfast was a bit expensive for what it was. Pancakes = 1 pancake. Very friendly staff, super nice food, best location. Food was very good! Lovely eating area with a great view of the beach! Bar drinks were delicious. Located on 0.6 mi of private beach, Kactus offers accommodations on the sunset side of Koh Ta Kiev. Guests can enjoy meals at the in-house restaurant or have a drink at the bar. Some units include a seating area where you can relax. A balcony or patio are featured in certain rooms. Rooms are fitted with a shared bathroom. All the bungalows at the property have a powered solar light and a USB plug for charging. 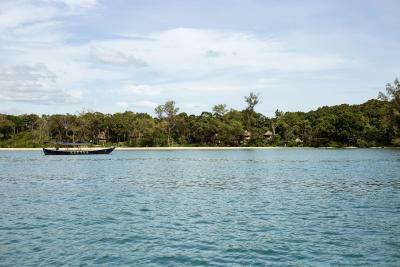 Guests can engage in various activities, such as snorkeling, kayaking, night swims and island hopping. Kactus's in-house restaurant serves up a fine dining menu prepared by the property's French-Cambodian chef. 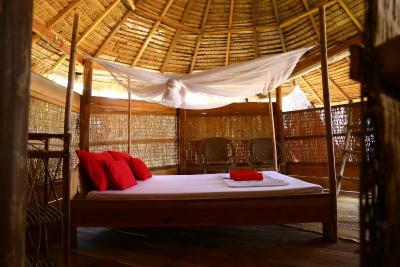 This property is also rated for the best value in Koh Ta Kiev! Guests are getting more for their money when compared to other properties in this city. 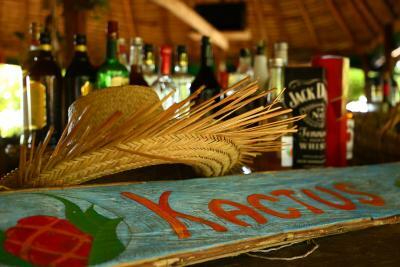 When would you like to stay at Kactus? This bungalow has a balcony, seating area and private entrance. This bungalow features a patio, view and private entrance. This bungalow has a balcony, private entrance and seating area. This bed in dormitory has a private entrance and garden view. This bungalow has a private entrance. House Rules Kactus takes special requests – add in the next step! Kactus accepts these cards and reserves the right to temporarily hold an amount prior to arrival. Please note that public ferry or speed boat services are not available in the area of Koh Ta Kiev. 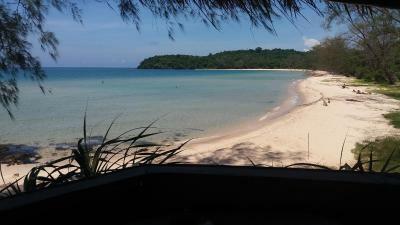 The property offers a scheduled ferry transfer service to/from Otres1 beach and Kactus guest house. A ferry leaves daily from Otres1 in front of Pohato tours at 12:00. Return tickets are available for an additional charge. In room fans would be good. It gets HOT at night. The beaches a bit further out are quite full of trash (not Kactus fault), but the one right next to the bungalows are cleaned up. As you pay with a tab system, your bill adds up quite fast ( have to ask for the prices). Food was amazing! Fresh and delicious. The staff is super friendly. Lots of cute drawings and an eye for detail. The bungalows have an amazing view and are clean. The dorm had nothing to do with cleanliness. I got bitten by bed bugs there, also saw other people bitten all over, which didn't look like mosquitoes. Something needs to be done about the plastic coming by sea from Vietnam, although I understand it's not at all their fault. Not enough bathrooms - queues at times. 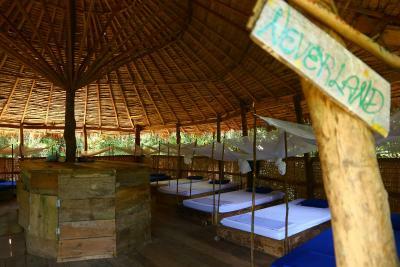 Lovely huts & dorm in the jungle, next to a nice beach (though polluted with plastic), good food worth its price. Great that you can take the free daily boat to the other beach (and back). Short walk to the 'Last point' beach - beautiful but with even more rubbish :( Nice staff (even though somehow you feel their a bit too business attitude) It seems that they have the latest available boat to the mainland from the island (3 pm) - good. It’s sad to see the over development of the main land. The environment was magic and a rear find... completely off the grid, quiet, beautiful, excellent food and the staff were amazing! The terrace (!!! 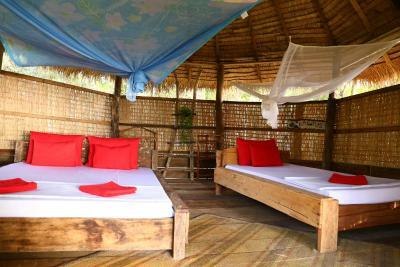 ), the bungalows, the food (though it‘s a little expensive ;)), the beach, THE ISLAND!!! The beach on the resort is full of plastic wastage washed up from the mainland. It's ugly and horrifying. I spent the entirety of my one free day trying to help clean it up, I must have found at least 5 syringes, a few with needles. The food was excellent, the staff friendly. Suggest to equip life vest in the ferry. I like the style although it is not the favorite of my partner. 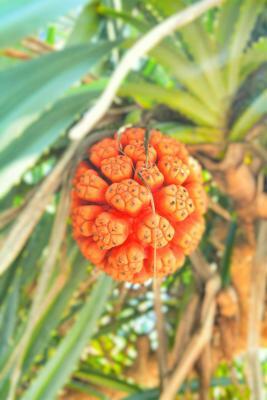 I like the nature smell on the island. Personally I hated the shower facilities. I have a phobia of spiders, and sadly that can't be helped as this place is pretty much inside a jungle. Bring lots of mosquito repellent and perhaps snacks, as food is served at fixed hours. This place is really something special. 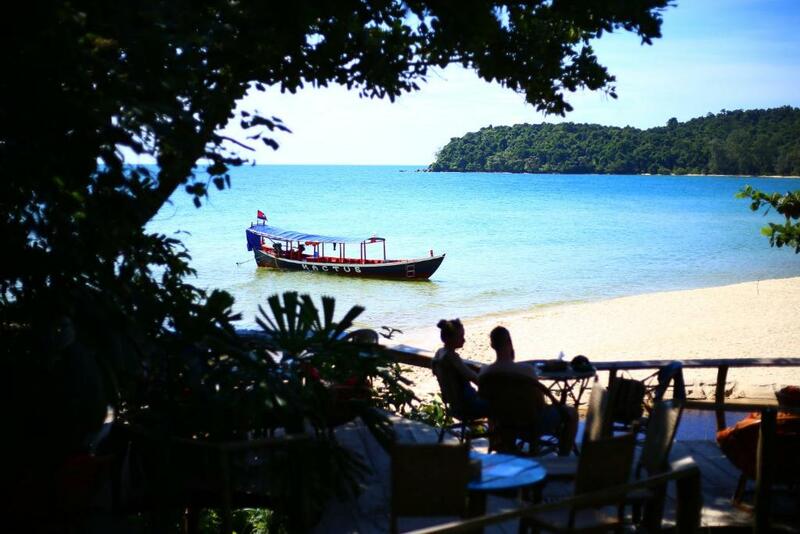 From the deliciously inventive daily menu to the stunning sunsets and remote beaches. Not to mention the staff -- a wonderful bunch of people who made the stay even better. Highly recommend to anyone looking to get away from the mainland and away from the world of wifi for a few days. You won't want to leave, is the only downside. This place feels very much staff orientated and less about the guest's enjoyment. We had read reviews before coming so were loosely aware of this, but it surprised us to have to get out of bed at 2am, trek across the site and just to tell just three drunk staff to maybe turn the music down a bit. The volume was maxed out and sound travels far here. Bit dirty in places, as in the wash water wasnt something we fancied in our allocated bathroom (we used another instead). Beach littered with plastic, so would love to see the incentive schemes present on the other island guesthouses extended here. It works. 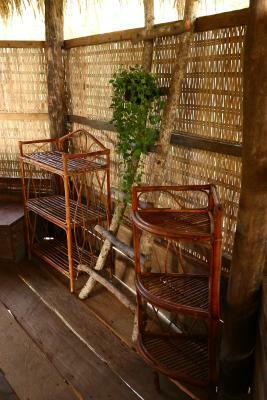 Day staff were friendly, bar/restaurant area nice, liked the seating area in our tree house. Good sunset. Everything was great, but take mosquito repellant !!! The food here is absolutely amazing, it's woRoth travelling here just for the food alone. The beach is lovely and the cleanest we saw on the island, we snrokelled at night in the plankton and it was really breathtaking. Staff are super helpful and took good care of me when I was sick, really appreciated. The hits are super cute and I love the layout of the place, a real eco village. 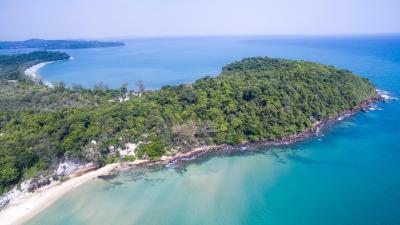 I highly recommend staying here, this was our favorite island in Cambodia. The whole experience was amazing. This is paradise!! Now, let’s talk about the bad points, much longer. 1. As soon as we arrived on the island, we immediately understood the philosophy of the staff: money-driven. I understand, I work in the tourism industry as well, but you have many ways to sell. And I do not like their way. One by one, they came to us to seem whatever they can. 2. 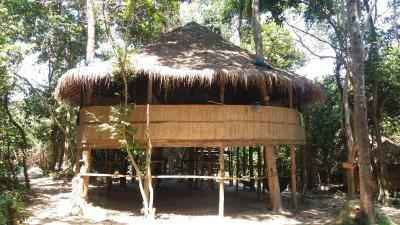 We spent 2 nights in hammocks (5$/night) and 2 nights in garden view Bungalow (25$/night). I am still wondering what I paid for. The accommodation is basic. And you don’t have any service included in that price. Overpriced. 3. As I said, the food is tasty but 7,5$ for vegan plate!!? We had only rice with fried veggies. I didn’t know that vegan plate was as expensive as fish and meat. Plus, for that price, we expected a greater quantity. No sense. 4. The plastic situation is dramatic. Kactus staff might clean only the first 20 meters. We went to the end of the beach and it is full of trash. We did our part by removing around 50kg of trash. On the island, they burn everything, which I can understand as they lack of alternatives. But all along the beach, we found pile of unburned trash. Do they wait for the wind to bring them back in the ocean? Plus, they put several cart boards written « plastic-free beach in process ». 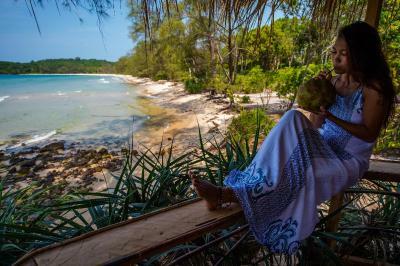 But how can you have a plastic-fee beach if you keep using and selling plastic on the island? At Kactus, they use single-use butter, single-use sugar, single-use soap and plastic bottle. At least. For sure, they are not the only responsible for the trash on the beach but they are far away from doing the right thing. Desperate. 5. If you are looking for calm place to relax and rest, look for another island. The music from the bar is loud and above that there was a festival next to Kactus. In a word: I do not recommend that place. Bad service, over-priced and the staff seem to be king on this island. I’ve spent 4 nights at Kactus village with my girlfriend. It’s been 3 months we are travelling now, we have already been on several islands before. Let’s start with the good points, it will be short. 1. It’s really pleasant to be offline for a couple of days. 2. It’s great to spend your day in the ocean. 3. The food is tasteful. It was perfect other than the evenings being very warm. The ocean breeze stopped around 10pm. The staff was super friendly and helpful. 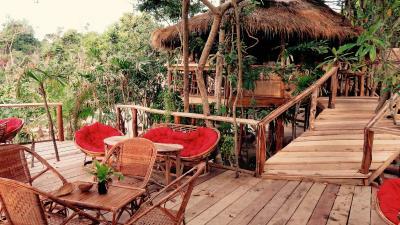 I stayed in a tree house away from the restaurant so it was very quiet and relaxing. The food was amazing! 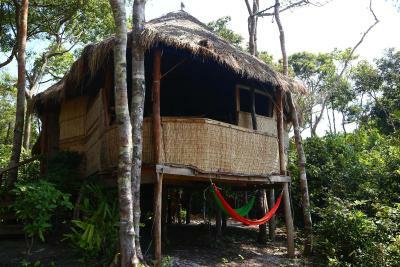 My boyfriend and I came for 4 nights at Kactus: 2 nights in a hammock, 2 nights in a bungalow. 1- We had a welcoming arrival although we were asked several times if we wanted to switch from the hammocks that we had booked for the first 2 nights directly to the bungalow, more than twice as expensive. The whole staff only wants us to pay as much as possible: easy when you are the only place to stay and eat close by. 2- We had basic vegan meals - rice and fried veggies - every day and paid the same price as other meals with fish and meat, $7,5. For that price, it was not even fulfilling. 3- The accommodation is super basic. For $25, you don’t even have a proper electric plug nor a small fan in the bungalow. 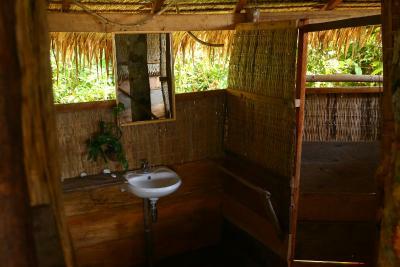 4- The shower and toilets are common. On the last day, most of them were closed and for our last shower the water turned out to be mud. 5- The beach seems idyllic from the boat but is clean on 20 meters only. Then, it is 1 km of waste, a true ecological disaster. We quickly understood why when we saw all the waste accumulating behind the beach: Kactus puts everything there before burning it. With a bit of wind, it goes back on the beach and into the ocean. The funniest is the sign: “Free plastic beach in progress”. Can we go freely to a beach full of plastics thanks to them? Single-use plastic is everywhere: bottles, soaps, butter... Water refill is not even for free. I am not sure they can manage their waste properly if they produce that much. 6- The staff does not seem really involved in satisfying the clients. I guess they are here to relax more than work. There were always at least 3 of them lying on a hammock or drinking at the bar. 7- The music from the bar gets really loud at night. Most people here come to drink and smoke weed rather than to relax and sleep well. If you’re not in that mood, don’t go to Kactus! 8- Last but not least, my shoes got stolen. 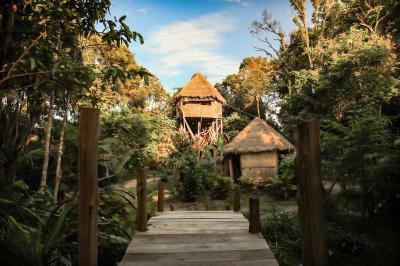 Truly beautiful place, and our treehouse The huts are basic in a beautiful way, and very clean everything you need, Inc mosquito nets. We had the huge treehouse, which is incredible about 30ft high near the tree tops Lovely food, but only two options in the evening.